I am a mascara junkie, having tried everything from drug store brands to high end ones at department stores. After a lot of trial and error, I feel that I have found the perfect mascaras. Yes, notice the “S” because just one mascara isn’t going to cut it. However, I am happy to report that although I am recommending you buy two mascaras, I found two that are both really affordable and can be found at places like Walmart and Walgreens. The “power couple”, as I call them, is a mix of Maybelline’s Lash Discovery Mini Brush in Very Black Waterproof and CoverGirl’s Clump Crusher Lash Blast in Black. The first one costs about $5 and the second is around $6.50. Even together, these two mascaras are still a lot less then most mascaras you will find at a higher-end cosmetics or department store. The Lash Discovery has a tiny little wand and helps to find all those little lashes and really make them pop, especially on the inner and outer corners of my lashes. I also love this mascara for my lower lashes…it is the only one I use. It gives great length but has a little bit of clumping in it and that is why I paired it with the CoverGirl Clump Crusher. This mascara has a bigger plastic wand and is great for volumizing, curling and, as the name implies, crushing clumps! These two together are simply amazing! base of the inner corner and slowly wiggle the brush up and through my lashes. I do this all the way along the lash line. Then at the outer corner, I take the end of the brush and really focus on the outer corner lashes for a fanned out effect. Next, on the same eye, while the first coat is still wet, I go over the lashes with the CoverGirl Clump Crusher, wiggling the brush again at the base and pulling straight up. It gets rid of all the clumps and really adds volume to my lashes! 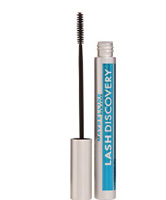 Repeat on the other eye and then use the Lash Discovery mascara on the bottom lashes for a dramatic, wide-eyed effect!